- This car was 1 of the 2 secrets car hidden in the "Toys in the Space 1" track. - In geometry, the tesseract is the four-dimensional analogue of the cube. - This car's top speed, of 44.4 is not a case (also it was meant to be 44.444444... but it was too hard to achieve xD). - This car's acc in the original parameters was instant but it was too op and i slowed it. 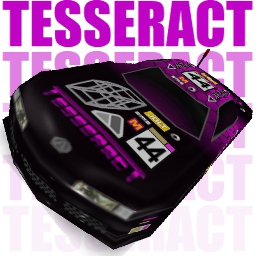 - For the creation of this car, i got inspired by StrixMidnight's XYZ (my favourite car of his creations), in fact, this car's original name was "XYZW", then i changed it to "Tesseract" because that name was too similar to the StrixMidnight's counterpart.